Adamu Shachū had a humble celebration on the Sunday night after an intensive week at Wafūdō, the home of the Ueda Sōko Ryū. 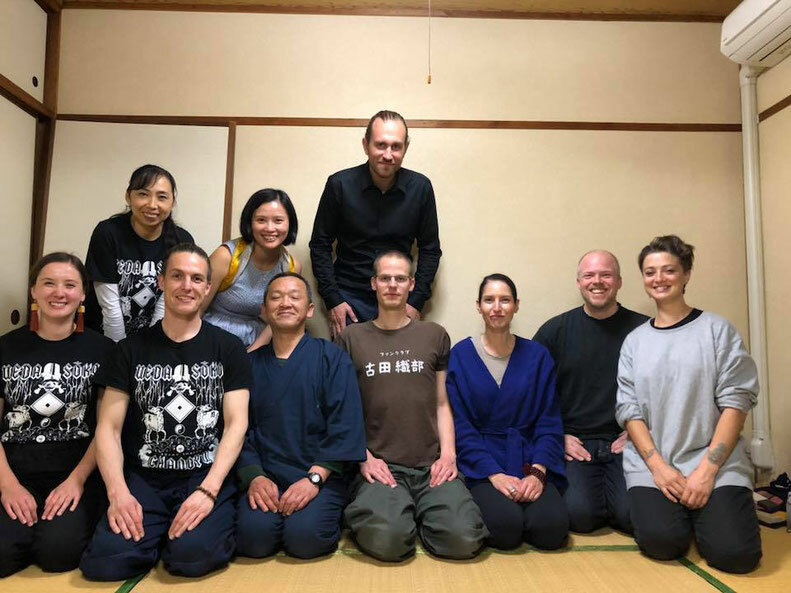 The week involved lots of keiko (practicing the forms), chaji practice, samu (mindfulness chores) and the week culminated in the receipt of sōden qualifications by many students. Fukuma Shihandai* took Adamu Shachū students for many hours of keiko and also a practice chaji. He also had a major role in the sōden qualification ceremonies. He eased the nerves of many students with his loving, charming and funny style. As a surprise to everyone, Fukuma Shihandai received the Shin Daisu Midare-kazari sōden (secret transmission) from Grandmaster Sōkei as part of the formalities of the sōden weekend. This is the highest possible sōden of the Ueda Ryū, reserved for the Grandmaster except for very rare occasions such as this, and very rare people like Fukuma-sensei. Despite receiving possibly the highest honour of his chanoyu career a couple of hours before, Fukuma Shihandai honoured his promise to celebrate with us on this night. As we had to move out of our accommodation at Wafūdō the next morning, our 'banquet' involved nothing but improvised dishes with the food remaining and a few pizzas to fill the table. As it turned out, Grandmaster Sōkei caught wind of what was going on and gifted us a bottle of saké to enjoy. With this grand gift, the honour of Fukuma-sensei's company, and some humble sustenance, we had an unforgettable end to this year's intensive at Wafūdō. Adamu Shachu students were able to talk intimately with Fukuma Shihandai, the second most senior person at Wafūdō next to the Grandmaster. Discussion went late into the night, a string of priceless moments. Thank you Fukuma-sensei for your guidance and wisdom. You're a hero to Adamu Shachū and have a special place in all of our hearts. *Shihandai is a deputy role to the Grandmaster, making this role the most senior teacher under the Grandmaster. There are two Shihandai roles in the Ueda Ryū.